Stress is directly proportional to the strain, within elastic limit. The ability of a material to retain its original shape after removal of applied force is called elasticity. As stress increases, there will be an increase in strain. The material behaves like a spring that regains its shape after the stretching force is removed. 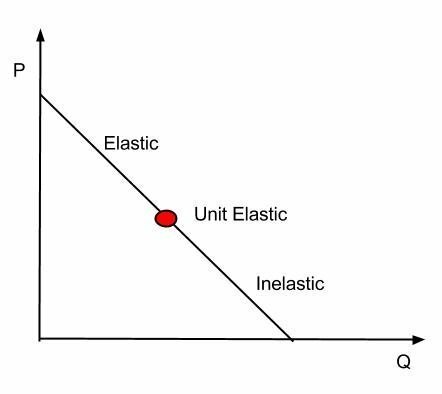 To work with the material within the elastic limit is undesirable because it is an uneconomical choice and enables unnatural material behavior. Material properties are not fully utilized under the elastic limit. This is used when there is a chance of unpredictable future loading or calamity. When the material reaches its elastic limit, it will lose its elastic properties and is considered deformed because the shape has become permanent and the material cannot regain its original shape. The material will undergo notable deformation with a slight increase of stresses. Most of the structures are designed considering this change in materials and checks are made for crack width and deflection. 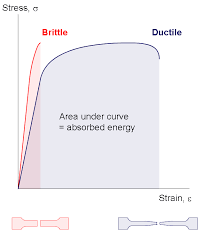 Ductility of a material is the unelastic property of the material. Most metal possesses ductility. When a metallic rod or wire is stretched, it will elongate. The diameter of rod or wire decreases continuously, this process is known as necking. The material also shows ductile behavior due to increase in temperature. Brittleness is opposite to ductility and involves materials that reach failure without any warning. When the stress is applied more than the material's capacity to resist, it cracks or fractures. Concrete, Glass, Ceramics and stones are considered to be brittle materials. Steel may also break but it yields first to give warning prior to failure. Toughness is the property of material to resist fracture. It means that material can absorb the energy and resist the applied force. A tough material is one that has more strength and ductility. A high strength concrete mix is more brittle compared to a low strength concrete mix. The higher strength does not necessarily mean that material is tough. Toughness is the behavior of the material under impact loading. Strength is the capacity of a material to resist the applied force and stresses. 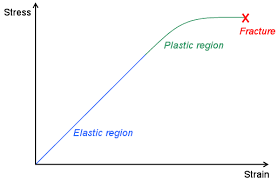 The ultimate strength of material depends on both elastic and plastic strength. The strength of a material is a property that is considered in the design. There are different types of material strength. These are axial, flexural, shear and torsional strengths. Axial strength includes tensile strength and compressible strength. 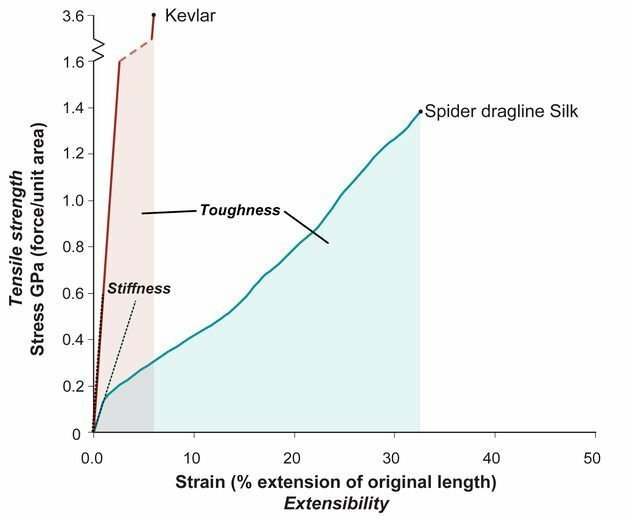 Tensile strength is the capacity of a material to resist tensile stresses, while compressive strength is the capacity of material to resist compressive stresses. Tensile stresses may cause elongation and yield while compressive stresses lead to buckling. Steel has ten times more tensile strength compared to its compressive strength. When the force is applied perpendicular to the cross section, it bends it into a curve. The stresses developed due to this curvature is known as flexural stresses. 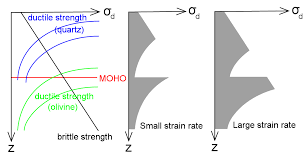 The stress acting parallel to cross section and tries to shear/cut it is called shear stress. Force/stress that causes twisting or torsion in the member is called torsional stress. The resistance of the material against flexural stress, shear stress, and torsional stress are called flexural strength, shear strength, and torsional strength. The hardness of materials is the resistance of surface against abrasion, indentation, and scratching. Hardness is not a measure of structural strength. It is a parameter for surface finishes, pavements, and runways. Diamond is considered the hardest material and is used for measuring the hardness of any material by indentation and scratch test. Diamond is also used for cutting rocks and drilling boreholes. The property to the material to resist elastic deformation is called stiffness or rigidity. A rigid material undergoes slight or almost zero deformation. 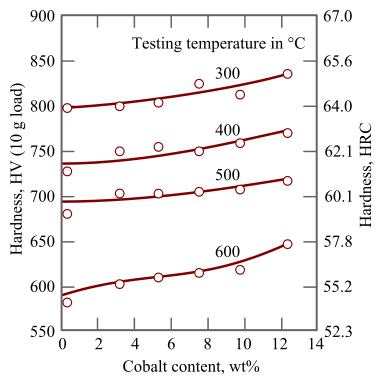 Stiffness can be increased by increasing the cross section. Different materials have different stiffness values. A steel beam will be stiffer than an aluminum beam of the same cross section and applied loading. Stiffer is the member, lesser will be the deflection. 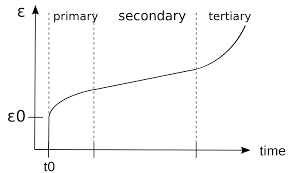 Long-term deformation due to sustained load is called creep. When a material is stressed for a long time, it deformed permanently. This deformation continues slowly till it reaches its creep failure. Structures such as bridges are exposed to heavy traffic loading, similarly, the industrial building serves for impact and vibration. Deformation in such structure propagates from cracks to rupture. MLA (Modern Language Association) "Types and Uses of Construction Materials." ScienceAid, scienceaid.net/Choose_a_Construction_Material Accessed 25 Apr 2019. Chicago / Turabian ScienceAid.net. "Types and Uses of Construction Materials." Accessed Apr 25, 2019. https://scienceaid.net/Choose_a_Construction_Material. Thanks to all authors for creating a page that has been read 1,326 times.